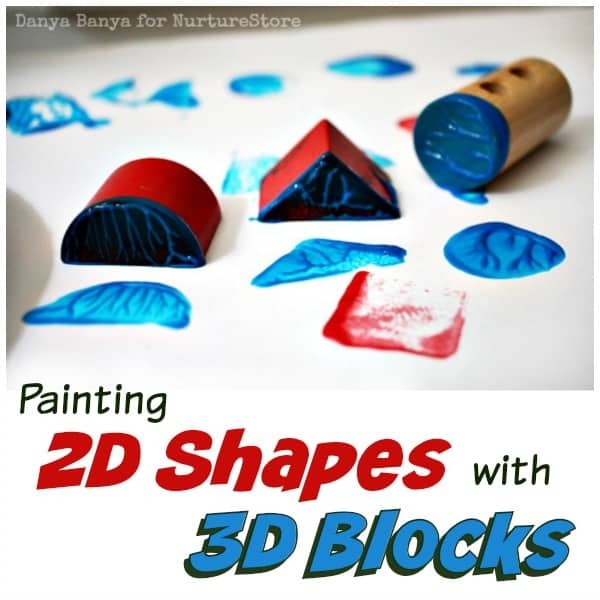 Danya from Danya Banya has a fun kids’ art idea for our ABCs and 123s series – stamping with 3D wooden blocks to create 2D shapes! 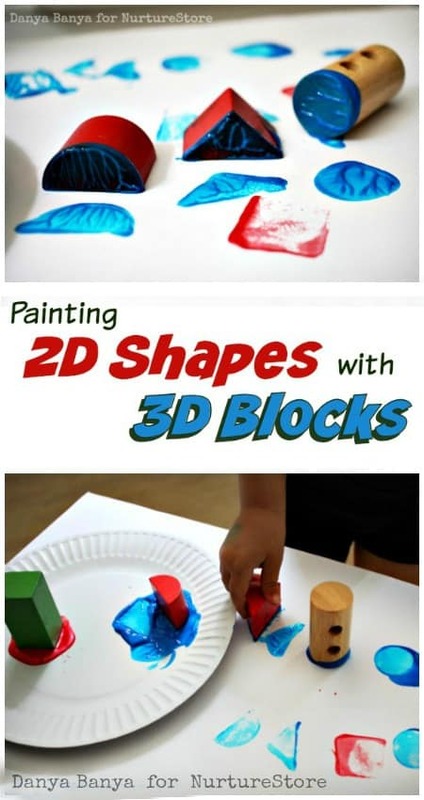 It encourages kids to explore 2D and 3D geometry in a creative, hands-on way. We’ve been exploring a lot of shapes and geometry at our place lately. My 3.5 year old daughter Bee is just starting to grasp that two dimensional shapes (squares, rectangles, circles, triangles) can relate to three dimensional objects (dice, cereal boxes, balls, tents), and that the shape of these 3D objects have their own special names (cubes, rectangular prisms, spheres, triangular prisms). I thought it might be fun to tap into her current interest and see if I can extend it further. So far, her thinking has been in one direction – that 2D shapes can relate to 3D objects. I wondered if she could think about it from another perspective. Could she relate a 3D object back to a 2D shape? 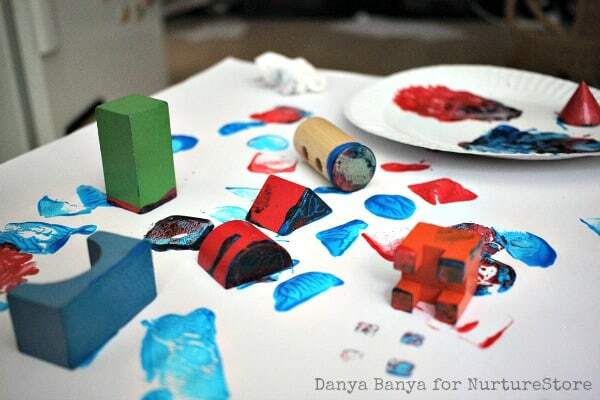 I set out an invitation to paint with paper on a low table, two colours of paint, and various wooden blocks from her set. We love painting with unusual items at our place, and Bee was keen to start straight away! As this was a process-oriented art activity, I didn’t give Bee many instructions (other than try to keep the paint on the paper, and please don’t paint the walls). 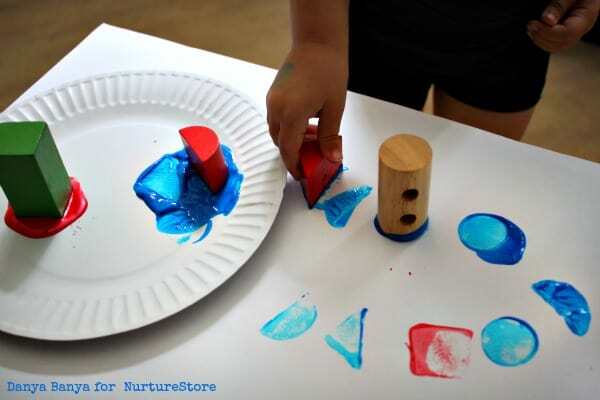 Bee picked up the cylinder first, dabbing it in the blue paint, and stamped circle shapes onto the paper. We talked about what shape it created, and what shapes the other blocks might make. She picked up each block in turn and stamped to find out. Bee used the different shaped blocks to create art. Sometimes she stamped the same shape several times in a row (and then, totally without prompting, counted them). Sometimes she alternated between two different shaped blocks to create a pattern. Playful maths! There were a few surprises. Bee wasn’t expecting, for example, that the base of the cone would create the same shape print as the end of the cylinder. She did a little experimenting with colour mixing too, seeing what would happen if she mixed red and blue. I did this activity again when my eldest daughter JJ (5.5 years old) came home from school. She was keen to try printing with the curved side of the cylinder and cone. She was certainly surprised when the curved side of the cylinder didn’t print a curved shape! At the end of the day, neither of the resulting artwork were particularly spectacular, but that doesn’t matter. The most important thing is that the girls had an opportunity to consider geometry and shapes from another point of view in an unpressured, explorative, hands-on way, they had a chance to be creative and above all else, they had fun! Danya is an Aussie stay at home mum of two little girls, JJ and Bee. 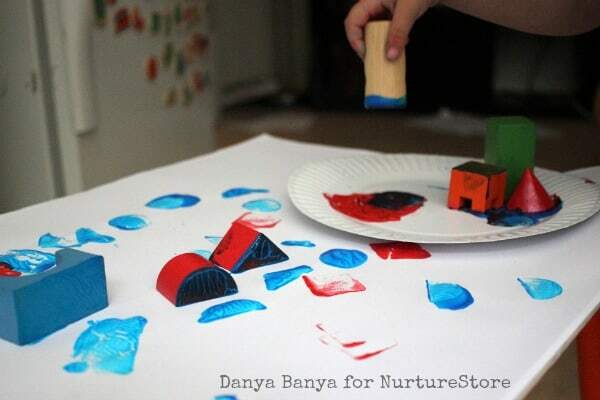 She started her blog Danya Banya as a way to share the fun and creative activities they get up to at home. There’s lots of easy kids’ art and craft, fun things to do and games to play. Subscribe to their newsletter to keep up with their antics via email. How can you use LEGO® to teach math, spelling, science and art? 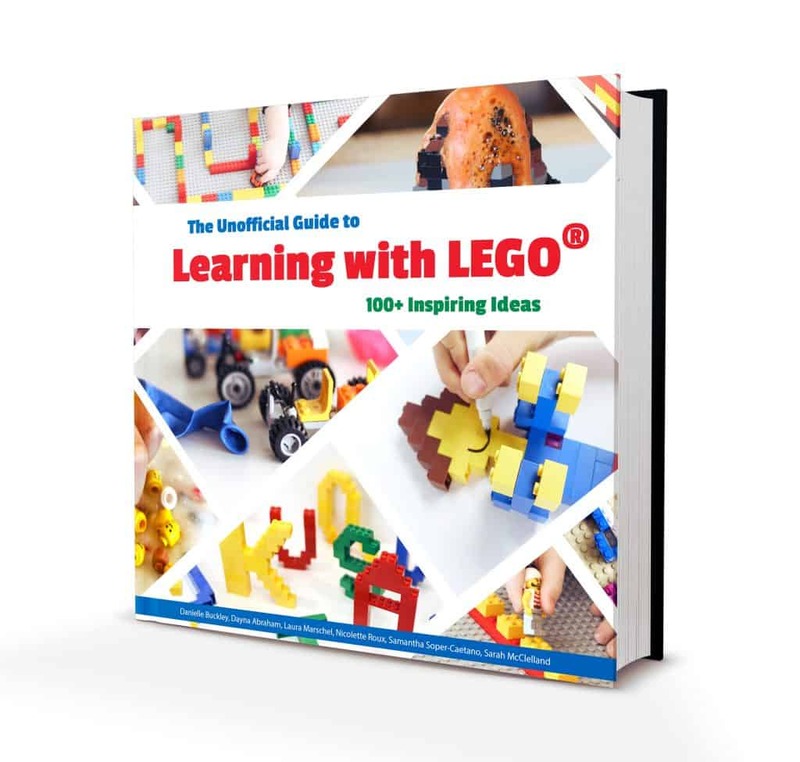 The Unofficial Guide to Learning with LEGO® has over 100 LEGO® activities for kids will show you how, with ideas for using LEGO® bricks for learning right across the curriculum. These resources invite your child to stretch their imagination and skills, in lots of new ways, and use LEGO® bricks to learn about math, literacy, science, design, engineering, fine motor, sensory, art and more. There are so many ideas here! You can use them to teach and for play, on rainy days, holidays, and as part of your homeschool or classroom curriculum. See more and download your guide to learning with LEGO ® here.